Holy Special Guest, Batman! Who’d have thought we’d have a massive TV star on our show already, right? 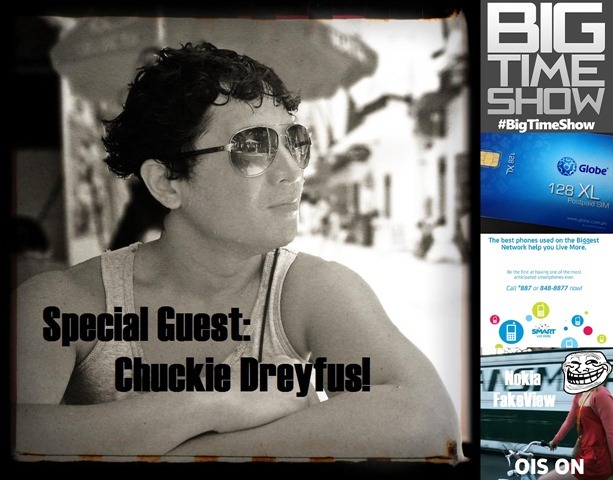 This week, we welcome celebrity actor and songwriter Sir Chuckie Dreyfus in our show, talking about My|Phone android phones, Nokia’s New Lumia phones, Globe’s Nano SIM, Smart’s *887 Teaser (both iPhone 5 related), Globe’s iPhone 3GS/4/4S Sale, Smart’s new LTE 1900/2100 bands, and your usual blog announcements from our BTS Crew. Of course, your favorite #CookingWithNFC segment is there, headed by your favorite NFC Chef! As usual, you can check out all the action in our YouTube embedded version after the jump, or you can listen to the show via our MP3 podcast in iTunes / RSS / direct download form (also below). So hop on over and have a watch / listen! We honestly don’t know how to top this week’s guesting on the next show, but we’ll definitely try. Hopefully you liked the MyPhone Android talk there, which we think is one of the least covered devices in local tech media right now. So, next week? It looks like the iPhone 5 will finally be announced, Globe tips their hand with their Black LTE service, and more! Catch our show to find out more!